Why do romantic comedies make it so hard on themselves? All a good one really needs is charismatic stars whom the audience wants to see together, and a plot with the obligatory roadblocks the romantic duo can successfully navigate without breaking the spell of their chemistry. For a recipe with so few ingredients, Hollywood has made an incredibly large amount of bad dishes. The reason so many romantic comedies fail is that they are micro-managed to the point of madness. Something that should be as light as a soufflé is almost always served with the consistency of a brick. 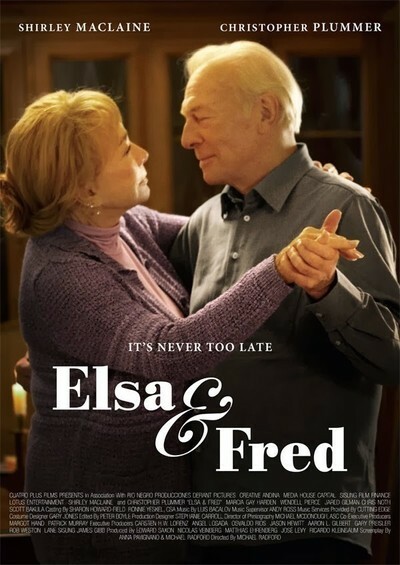 For its senior-aged couple, “Elsa & Fred” presents a grouch and a compulsive liar, the latter of whom is so incredibly unlikeable that you root for the grouch to drive her away forever. At least the grouch has reason for his temperament: Fred (Plummer) is a recently widowed man whose shrew stereotype of a daughter Lydia (Marcia Gay Harden—another Oscar winner completely wasted here) treats him as if he’s gone senile. Lydia hires an African-American caregiver (Erika Alexander) for Fred. The caregiver’s '80s aerobics instructor look and street vernacular get insulted by Lydia, and, in one unfortunate scene, Alexander holds up a watermelon in close-up and without irony. While Lydia represents the “those pesky young people are so ungrateful” subplot, Plummer hooks into these early scenes of resentment and bitterness, embodying them with a deeply internalized, unspoken suffering. You almost want his Garbo-like wish to be left alone to be granted, if only so he can reconcile the death of a wife he actually hated. But this is a romance, so one must allow for the hope that someone will rouse Fred from his misery. Enter Elsa (Shirley MacLaine), Fred’s next door neighbor. Elsa is the type of character a bad film has to constantly remind you to like. She’s a liar whose lies would doom all but the most masochistic relationships. She lies to Fred about her marital status, her family and her health. She does this while trying to drag the distrustful Fred from his shell and into a world where he can trust without fear. Neither the flighty, spirited characteristics of the youthful MacLaine nor the mama-bear fierceness of the latter-day “Terms of Endearment” Shirley could save Elsa from being an annoying device. Elsa puts Fred on a multi-step “process” to help “cure” him, but every time Fred steps forward in progress, one of her lies knocks him backwards with the force of a Mike Tyson punch. Elsa cleans things up by saying “trust me without reservations!” And Fred continues to trust her. It’s supposed to be romantic; it’s pathetic. Adding insult to injury, “Elsa & Fred” refers to “La Dolce Vita” in almost every other scene. It goes so far in its comparison to the superior Fellini film that it recreates the most famous scene from “La Dolce Vita”, complete with black and white cinematography. The intercutting of the smoking-hot, youthful Anita Ekberg with the much older (though still attractive) MacLaine mimicking her is the epitome of camp. And the scene of Plummer feeding a kitten yogurt with a spoon at Trevi Fountain should cause the cat-loving Internet to burst into flames. But I digress. George Segal, Scott Bakula and Chris Noth show up on occasion in barely fleshed-out roles, and Wendell Pierce provides mild amusement as an accident-prone landlord. They’re given little to do, but provide mildly entertaining distractions. Segal in particular reminds us how good he is at stealing a scene. Behind the camera, director Michael Radford and his cinematographer Michael McDonough make the most of “Elsa & Fred”’s New Orleans setting. The music by Luis Bacalov (“Il Postino”) is sweet enough to deserve a better movie.